Sony has posted a $2.1 billion net loss for the quarter ending December 31 and more than doubled their projected loss for the full year concluding in March. The once-strong Japanese electronics giant was up against a strong yen, weak TV sales, natural disasters in Japan and flooding in Thailand that disrupted supply chains across the globe. Sony additionally noted a one-off charge to Samsung for bailing out of a flat panel joint venture and their decision to take full ownership of Sony Ericsson. As a result, quarterly sales dropped 17 percent. Should the expected $2.9 billion loss pan out, it would mark Sony’s fourth consecutive year in the red. It goes without saying that CEO Kazuo Hirai will have his work cut out for him when he takes over for current CEO Howard Stringer effective April 1. At 51, Hirai will become the company’s youngest CEO to date. 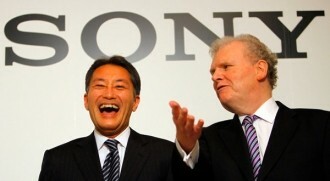 Sony shares have dropped more than 50 percent since Stringer took over as CEO and chairman in 2005. Taking the podium at a news conference after being named CEO, Hirai said that Sony must steer a new course moving forward, even if it meant making many painful decisions and executing them. Hirai knows that his rivals and the operating environment won’t wait around for the company and action must be taken immediately. An estimated net loss of $2.9 billion for the year ending in March is much higher than earlier estimates of around $1.2 billion. CFO Masaru Kato says Sony should be able to halve their losses in the TV market in the next fiscal year, however.